I'm really enjoying this podcast. I heard Erin Gloria Ryan on Pod Save America, which is a refuge from these horrid times. Now I have Girl Friday too! Wonderfully funny and smart women. My favorite pod (ð). Can't wait for new episodes! Omg why is the theme music so much louder than the voices?!? I love this podcast dearly and I want all of these women to be my cool aunts (I already have real-life cool aunts, so this is high praise). Erin, Briana, Amanda... won't at least one of you come shoot knowing looks at me every time my racist grandpa makes a racist comment at Thanksgiving? Please? This podcast has awesome hosts who take on inspiring and interesting guests every week! This is a really great podcast. Erin is an awesome host, and the guests are always sharp, funny and entertaining. Their discussions of politics and culture are really enjoyable; they go from really serious to really funny, and that's hard to do. I've learned more about feminism and what feminism means from this podcast. I definitely recommend it. The bar could be raised. Too much valleyspeak. Overuse of inflections and the word "like" distracts from what could be a substantive discussion. The discussion often degrades into vulgar contempt. Good ideas and witty insights are often lost in the overzealous banter. This makes the podcast reductive and borderline distasteful. Love the awesome women and great conversations on this show. I love these gals. I wish they were my friends in real life so they could rub off on me in their smarts and feminism. At least on Fridays they are my friends lolAlso God I think it's hilarious when Amanda makes voices and you have to pay attention to catch it cuz it's kinda just background observation narration to the dialogue. I die. Dear Hosts at Girl Friday,I recently came across your episode featuring Jessa Crispin, and though I hadn't heard of Girl Friday, as a filmmaker and aspiring journalist the idea of a podcast for and about women in the media. Intrigued by Crispin' book excited me. I eagerly downloaded the episode and subscribed to the podcast. Within 15 minutes of listening, the irony of this episode struck me. This crucial conversation--featuring a feminist against the feminist movement on a woman-hosted show critiquing mainstream feminism-- is littered with incessant qualifications to your statements and interview questions, questionable up-speak and vapid tangents, all of which dilute the impact and dull the message of what could have been an invaluable conversation for your listeners. Examples such as "I know you've already heard this but" ending statements in "but I don't know", and"likes" peppered over nearly every idea fail to model confident speech and competence. This sloppy conversation oozes with tangents and explanations while lacking focus and concise contributions. Your way of speaking starkly contradicts the topic of this episode, and thus actively erodes the mission of your podcast. In a society that conditions woman to idle for permission and for others to validate her opinions and beliefs, crisp and coherent expression demonstrates woman's ability to trust herself and her contributions. I write this because I believe in the potential of your podcast to thrive, as it provides much needed space and power for critical and thoughtful female voices in mainstream media. I admire your expertise and successes, and as a young person green to the career world, I attest to the need for role models. A thick trail of white, hetero, male expectations inevitably shapes us all, divulging itself even in the subtle way we express ourselves. I challenge you to become clear female voices that live up to your impressive career experience rather than compromising it. Heard of this podcast through another pod, and it has quickly become a weekly fix. Hearing intelligent women discuss topics important to me are voices needed at this time. I can not get enough of the "Man displeased" and "it's a metaphor!" segments. Smart women discussing news and media and politics unapologetically. A+ guests. Pretty funny and thought-provoking. Highlight: Amanda talking about punching people. I love them and I want to hang out with them! It's like they are in my head with how they discuss the current hellscape we are enduring in DC! Also love a fellow Midwest girl! Brilliant podcast with interesting guests and fantastic personalities. Erin & Amanda are informed and really f**king funny. Listening to them is like hanging out with friends, commiserating and getting silly. Cathartic. Woman pleased! Absolutely hysterical. By far my favorite podcast. This podcast is great. It comes out weekly with a recap of what's been going on in politics and culture and is really funny at the same time. A respite in the crazy world we live in. Smart, funny, powerful conversations between smart, funny, powerful women. I need this every week. I love the humor paired with the exhaustion of this hell we're living in. I love you ladies! There are not enough stars to represent how much I love this podcast. Smart, funny, motivating, interesting...I cannot get enough! The Girl Friday podcast is an infantile celebration of liberal circle jerking, complete with the requisite assumed superiority and concomitant virtue signaling, pathological altruism, white ethnomasochist oikophobia, suicidal xenophilia, forced outrage, etc. Unless you're a masochist, don't waste your time. I was already a fan of Erin Gloria Ryan's journalism and appearances as a pundit on Chris Hayes and Lawrence O'Donnell, so it's no big surprise I dig this podcast. The panel's discussions are irreverent, informative and (for like-minded listeners) cathartic. This podcast deserves to be a big hit. I love listening to these brilliant women respond to the current political climate with humor and insight. It's like hanging out with friends. I look forward to Friday, which is saying something considering the world we live in under #45. I know I'm not really the target audience but this podcast is great. I love it. It's so funny and the "man displeased" segment is fantastic. Just found this via crooked media pod, and catching up on old episodes is saving my sanity -- if not my life. Love listening to smart people talk! Ready to go displease all of the men. Excellent work gals, keep it up. Hilarious and insightful. I love that this podcasts provides a broader and more unique perspective on current events than many other sources - it helps digest issues, beyond just parroting them. And a great balance of rage and catharsis. And its ALL WOMEN!! Love it. Smart, accomplished women talking politics and culture. Hilarious, validating, rage inducing, and a small glimmer of light in the reality we're facing. What opportunity does a 52 year old guy like me get to eavesdrop on a group of sharp, hilarious, 20- and 30-something women beating around the news of the day? 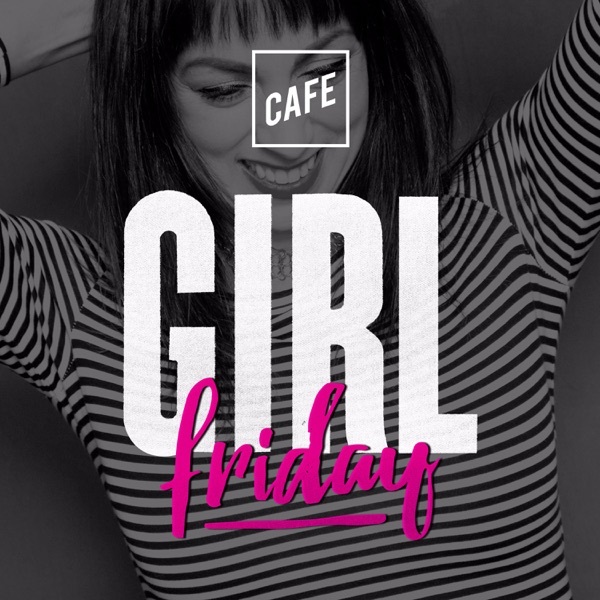 Well, a bona fide one, now that I've discovered the brilliant Girl Friday podcast! Love your analyses, observations, wicked wit, and personal reflections. You have provided me with a keener sense for who I want my 15 year old daughter to group up to be--an engaged, compassionate, total ball buster. A girl Friday, in other words! Rock on, sisters! And keep taking no prisoners! Love listening to these convos between smart, funny, insightful, outspoken women. Definitely will help keep me sane over the next 4 years. I'm an over 65 guy and I love hearing Erin steer an intelligent and uninhibited free-for-all conversation. Thanks to Jon Favreau for putting her on his podcast where I first became aware of her. I was so impressed. So glad you're doing this! I have been a lurker fan of your writing since you were a weekend comments moderator on Jezebel and we had similar day jobs. When I heard you as a guest on Pod Save last week, was so excited for another forum in which to hear your hot takes. More feminist reporters, podcasts, humor, and analysis please! Ps. You wrote one of my top ten articles on running ever (also in Jezebel). I'm here thanks to the guys from Pod Save America. I'm so happy that this podcast exists. This podcast is filled with such lovely, hilarious, and moving discussions between ladies. I was referred to these guys by the guys at the crookedmedia pod after Erin was a guest.These girls are laugh out loud funny and wicked as well.On a production note: when they laugh out loud the volume is really piercing compared to the dialogue volume. I raise to a 5 of 5 when I don't have to adjust the volume to listen to the laughter.Thank you for all the efforts. This is good work. The tequila shot every women needs on her friday commute home. Heard you on Pod Save America and immediately came this way to subscribe. So awesome on so many levels. You are my role models. OK guys -- this is better than sitting on the top step of the stairs and listening in on your big sister's slumber party down in the rec room. I'm late to the party but just getting caught up and while I am (checking...checking...) a man, this is a funny, smart, entertaining and informative podcast. I just found this show today, and it made my afternoon SO much more enjoyable! I downloaded and listened to 4 episodes to get me through the end of the work day. I really enjoyed the fresh, open, fun discussion of the hosts and guests. I'm really trying to find more podcasts to hear from different perspectives, and this show really helps with that! Special shout out to Lauren Duca, you are a warrior goddess! A good panel of women, discussing interesting topics. My friday commutes have gotten much more interesting as I am able listen, laugh and cry to this amazing podcast. It's great to hear all of the womans' experiences, especially as woman in the public eye. The âMan Displeasedâ segment is something I especially look forward to, though it's sad since it marks the end of the podcast and means I need to wait another week for the next episode. Been loving this podcast for some time now and finally decided to review. Truly enjoyable. Keep it up!! !